• Full-sleeve design keeps your message visible even when there is no wind. • Huge 11.5 foot tall flag! • Knit polyester for long life. • Bright colors to attract attention. • Bold lettering gets your message out. -Flag color can differ from what you see on the screen since each screen represents colors somewhat differently. Also, sleeve color as well as image colors, can change from one printing to another. advantage of these offers). Life expectancy depends on weather conditions, handling and placement of flags. that had been out 24/7 for over a year in all kinds of conditions, including high winds and snow. 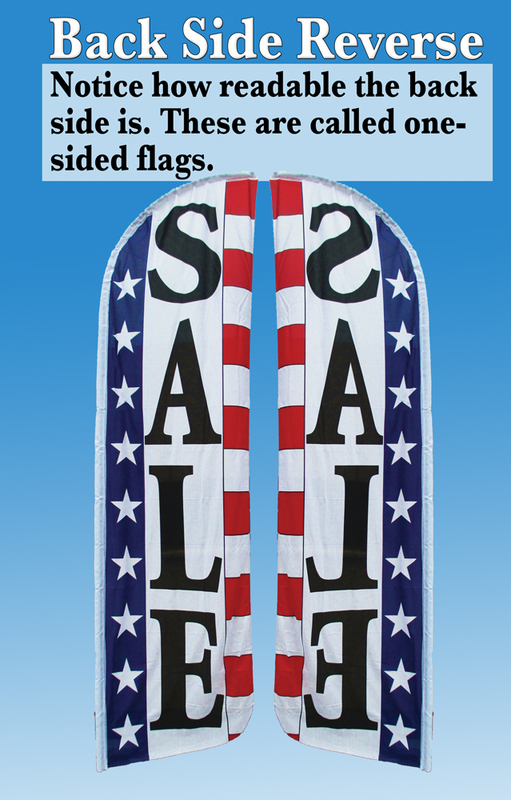 - Flag is "back side reverse" - printed on one side with 75-90% bleed-through on the reverse depending on color. See picture on next tab. These are considered one-sided flags, even though they can be read from either side. could be bad printing when viewed up close. These are a purposeful part of the design and not printing errors. related to returning the product. You can see from the picture that when the letters are run from top to bottom they are fairly easy to read backward. Many capital letters are the same forward and backward. Bleed-through is the amount of ink coverage flags printed on one side actually get to the other side. Our flags are machine screen printed. We do lose coverage with machine printing, but it allows us to bring these beautiful flags to you at a greatly reduced cost. 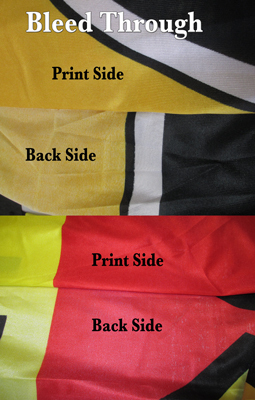 Bleed-through on these flags, because they are machine printed, is about 75 to 95% as you can see from the picture below. They look great from a distance, which is all that really matters in the end. Warranty: There is no expressed warranty for Feather Banner Products except for manufacturer defects. Feather Banner Products are for Outdoor use and are subject to the hazards of the environment, including vandalism and theft. Flags have a limited life span of 3-4 months, depending on weather conditions. We will NOT warranty for bent aluminum poles AFTER installation. Life span of all products may be extended by bringing products in at night and/or during high winds or stormy conditions. Manufacturing defects are evaluated on a case-by-case basis. General Return Policy - If we have subsized the shipping, returned products will be charged the balance of our shipping costs as well as a 15% restocking fee. Used products cannot be returned. Products must be new in original packaging. 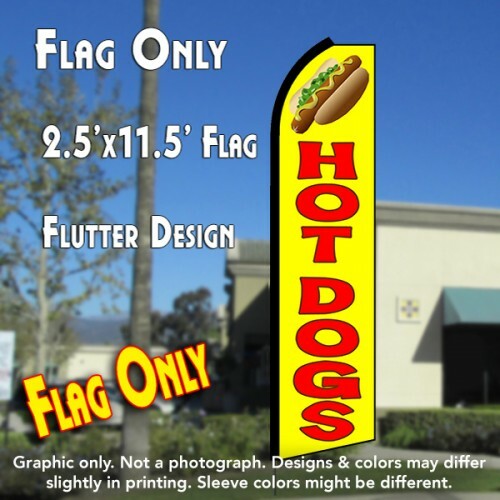 Custom Flags - Custom Flags are non-returnable.